This is just regular garlic from the store. One of the best things about gardening in Texas is that we can grow something almost all year long. Conventional wisdom says to get the garlic in the ground in October. 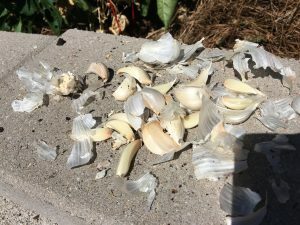 In cooler climates than mine, you also want to plant garlic in the fall, but you leave it in the ground until the next summer. Here in Texas, we plant it in October and harvest it in the spring. It grows all winter here because it doesn’t get that cold. 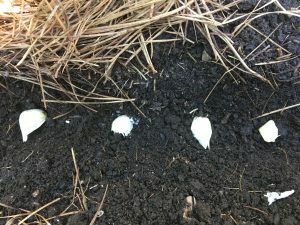 In cooler climaates the bulbs initially grow roots in the fall, then becomes dormant in the winter, then finishes growing in spring and early summer. 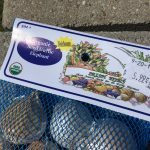 So, this weekend I am planting garlic bulbs. I’ve grown garlic in past years and never been quite satisfied with the size of the bulbs, so I’m hoping for greater success this year. 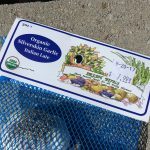 Everyone says to buy seed garlic and not plant garlic you buy at the store. They say that the garlic you buy at the store may have been sprayed with something to keep it from sprouting at the store, so it would not sprout as well in the ground either. Well, the garlic I buy at the store is organic, so it shouldn’t be sprayed with anything. 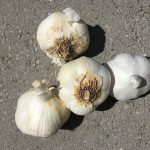 The other point about not planting grocery store garlic is that it is grown in other planting zones and may not be suited to where you are. This is a valid point. 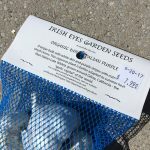 I had wanted to avoid driving down to my favorite garden store because it’s about a 45 minute drive each way, plus I can’t possibly go there and only buy seed garlic. So, that takes away from my gardening time. But, I do want to set myself up for success, so I’ll call and see if they have it in stock and drive down to get it. I do think I’ll plant the grocery store garlic as well and compare results. Stay tuned. 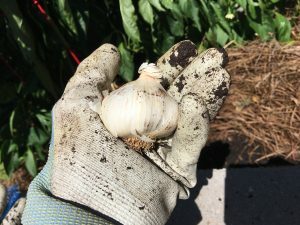 Here are some tips about growing garlic that I pulled together in preparation for planting my garlic this weekend. 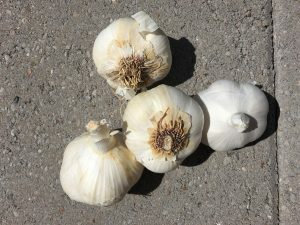 *Garlic prefers well drained soil and lots of sunlight. *Plant the larger cloves from each head of garlic, not the smaller wimpy ones. Makes sense, but I’d never considered that the larger cloves might grow better heads. *I’ve read about using the garlic scapes (the green stalks that grow up above the soil) in cooking, and how cutting them off helps the plant direct more effort toward growing the head under ground. I’ll try that this year. *I need to be patient about curing the garlic once I harvest it in early summer. I think I’ll do better about this this year because I was a lot smarter about curing my onions this past spring. I also had a big revelation about how I was not drying my herbs enough before processing them. I may be getting more patient in my old (?!) age. *Some places say that garlic repels garden pests. So, my plan is to plant garlic around the perimeter of several (all?) of my garden beds. 1. Break apart the heads of garlic into the individual cloves. 2. Plant each clove a couple of inches deep in soil with the pointy side up and the root side down. 3. Make sure your soil is nice and fertile. I’ve added worm castings to my planting holes. 4. Garlic doesn’t like to be flooded, but also doesn’t like to dry out until it’s about ready to harvest. Water regularly and evenly and not too much. The first step is to take each whole garlic and break it down into individual cloves. Which ones shall we plant? I tried to choose the biggest fattest cloves to plant. I did plant some smaller ones also just to see what happens. I dug a trough, lined up the garlic cloves, then covered them up, mulched with grass clippings, then pine straw on top of that. So, this is September 30, 2017. We’ll see how this goes!